From the Associated Press last week and reported widely throughout the US. 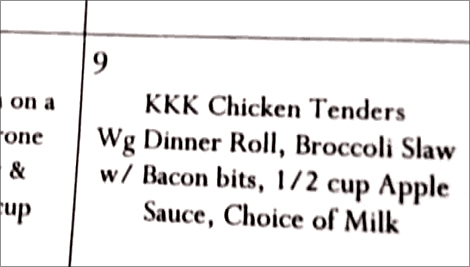 School officials in a Massachusetts town are apologising for sending students home with a lunch menu that listed KKK Chicken Tenders as an option. About 6,500 students in four Methuen schools went home with new menus on Tuesday with the apparent reference to the Ku Klux Klan white supremacist group. Superintendent Judith Scannell said the menu was supposed to list KK Chicken Tenders, with the KK standing for a creatively spelled Krispy, Krunchy, but a 'long-standing exemplary' employee mistakenly hit the K key a third time while typing the menu. Scannell apologised if anyone was offended but added that no one had complained to her. The food service director received only one complaint. However, the typo could have been avoided entirely if the officials hadn't chosen such a korny name for the chicken dish. So much for winning the hearts and minds of the young with klever marketing. Not to mention teaching them how to spell correctly. But what the heck is a Wg Dinner Roll? And 'a choice of milk'? Milk or what? Or are the lucky students able to choose between the milk of cows and, say, goats? It's funny you should mention that because I thought exactly the same. I looked it up and it means whole grain but why they write it as Wg I haven't a clue. Looks like a weight to me, as in kg and mg.